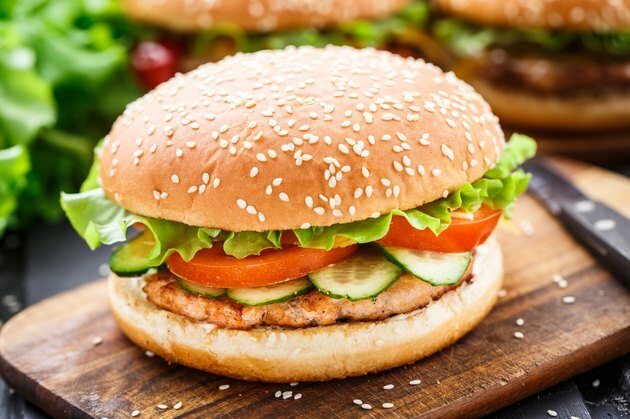 A healthier version of your typical hamburger, the salmon burger combines flaked salmon with a variety of other ingredients to make a flavorful burger. It tastes little like the fish fillet it started out as, with all the flavors you can use. If you have a favorite salmon burger, use it as your base and experiment with adding other ingredients. Cooking the burger is quick and simple, especially when done in a skillet. Using a skillet is the preferred method because it cooks the burgers quickly and helps to hold the burgers together. Prepare the ingredients, based on your salmon recipe. Some call for using precooked flaked salmon, while others suggest using raw salmon and pulsing it in a food processor to flake it. Combine the salmon with the other ingredients in your recipe. Ingredient suggestions include eggs, mustard, mayonnaise, breadcrumbs, minced garlic, soy sauce, chopped red or yellow pepper, Parmesan cheese, chives, parsley, salt and pepper. Form the mixture into 3 1/2-inch patties. Most recipes use enough ingredients to make four patties. Brush the bottom of a large nonstick skillet with peanut or olive oil, using a pastry brush. Place the skillet on a stove-top burner set to medium-high heat. Place the salmon burgers in the skillet, laying them evenly. Cook the salmon burgers on one side for about three minutes, turn them with a spatula and cook them on the opposite side for about another three minutes. The burgers should appear opaque in the center when completely cooked through. Serve the burgers on a bun topped with lettuce and tomato or coleslaw. FoodSafety.gov recommends using a meat thermometer to test the internal temperature. Your salmon burgers should reach at least 145 degrees F before consuming to help prevent food-borne illness.